If you are an investor interested in taking delivery of physical gold in exchange for your OUNZ shares (Delivery Applicants), you must submit a signed Delivery Application to us (the "Sponsor"). A Delivery Application expresses your non-binding intention to exchange shares for physical gold on the Share Submission Day or within the applicable grace period. You must also provide instructions to your broker-dealer to effect the exchange of shares for physical gold. Please see the steps outlined below. The Delivery Application expresses your intention to us to take delivery of physical gold in exchange for OUNZ shares. The Delivery Applicant Share Submission Form instructs your broker to submit OUNZ shares to the Trustee in exchange for physical gold. A completed and signed Delivery Application must be submitted to us by upload at www.merkgold.com/delivery; by fax to 650-745-7045; or by mail to Merk Investments LLC; Attn: VanEck Merk Gold Trust; 44 Montgomery St #3730; San Francisco, CA, 94104. We will only process a Delivery Application once the Processing Fees have been paid. The Processing Fee is due at the time the Delivery Application is submitted to us and is fully refundable until you irrevocably submit your shares to the Trustee. Click here for details on fees. Physical gold will be delivered to a Delivery Applicant based on instructions in the Delivery Application. Once physical gold has been tendered to the courier identified in the Delivery Application, the physical gold cannot be returned and is no longer the responsibility of the Trust, the Trustee, the Custodian, the precious metals dealer or us. The Trust will ship physical gold to a Delivery Applicant fully insured using accepted business practices for precious metals delivery that may include, amongst others, use of a conventional shipping carrier (e.g., U.S. Postal Service, Federal Express, United Parcel Service); or an armored transportation service. For additional information, please read the prospectus, as well as the OUNZ FAQ section "When will I receive my gold?" 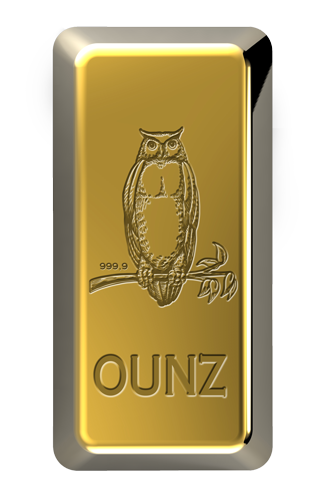 Let us help you take delivery of the gold you own through OUNZ. Please visit the OUNZ FAQ; contact us online; or call us at (855)MRK-OUNZ with questions. Click here to download the Adobe® Reader® to view and print PDF's.